UPDATED, March 6, 2013 -- Rogelio Tavio was released from jail in March 2013. You will hear a lot this week about Pope Benedict XVI during his visit to Cuba. Well, you also need to learn and spread the word about Cuban political prisoner Rogelio Tavío López. Rogelio Tavío Ramírez, 22, from Guantanamo, told Human Rights Watch that his father, Rogelio Tavío López, 48, had been detained since March 2. Both are members of the dissident group the Movement of Resistance and Democracy (Movimiento de Resistencia y Democracia). Tavío Ramirez said his father was charged with public disorder and “actions against the norm in the development of a minor” (acciones contra el normal desarrollo del menor) – a crime in Cuba’s Criminal Code that punishes parents and guardians for failing in “their responsibilities related to the respect and love of the homeland” – charges his son said were motivated by his political activities. Rogelio Tavío López has been on hunger strike since he was detained, his son said, to protest what he views as his unjust prosecution and the fabricated charges against him. Tavío's suffering is deplorable enough, but he is only one of countless Cubans in the Castro gulag because of their opposition to the regime -- each of whom represents the reality of Cuba today. We must pray that the pope gives voice to that reality while in Cuba. 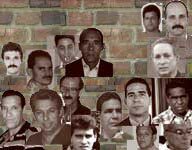 That the least that Tavío and other Cuban prisoners of conscience and political prisoners deserve.